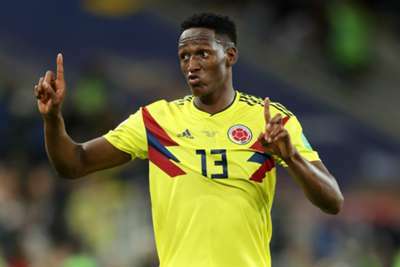 Yerry Mina will miss Everton's Premier League clash with Southampton on Saturday due to a small foot problem, manager Marco Silva has confirmed. The centre-back is yet to make his debut following his £28.5million arrival from Barcelona on August 9. Silva says the Colombia international is still recovering from a minor injury, meaning Kurt Zouma, who signed on loan from Chelsea last week, could make his first appearance for the club. "Mina is not available for the match," he told a news conference. "Zouma is available if I make that decision. At the moment, it is between him and Mason [Holgate]. "He [Mina] is recovering from a small problem in his foot. I hope next week I can give you some updates about the situation." Andre Gomes is also yet to appear for Everton after joining on loan from Barca and Silva says it will be "weeks" before the midfielder is available. "He had an injury in his hamstring during the US tour with Barcelona," Silva said of Gomes. "He will be back with the team in a few weeks training. "You are talking about weeks. You never know how a muscle injury reacts, but he is recovering well and could start training with us next week and see how he reacts." Everton expect to have Richarlison available, though, despite the winger picking up a minor problem in the 2-2 draw with Wolves last week. "Everything is okay with Richarlison," Silva added. "It was the first Premier League match and we played 50 minutes with only 10 players. "Everybody did fantastic work. You have to run like you have 11 players. He's only tired, nothing more." The KNVB has moved an entire round of fixtures, giving Ajax adequate rest before they face Tottenham in the Champions League semi-finals.